You need only claim the events of your life to make yourself yours. When you truly possess all you have been and done…you are fierce with reality. I am unsure how fierce with reality I have truly become! Yet I have found inspiration from these hopeful words: to be more daring in claiming the events of my life. Indeed, I can recognize a slowly emerging fierceness within me. I can begin to see more clearly the interaction between my experiences of living within intentional community, my work and travels, and of the growing activism and engagement in political life. It has been easier in the past to consider and share about these areas of life in isolation from each other. This wider perspective is a new discovery. 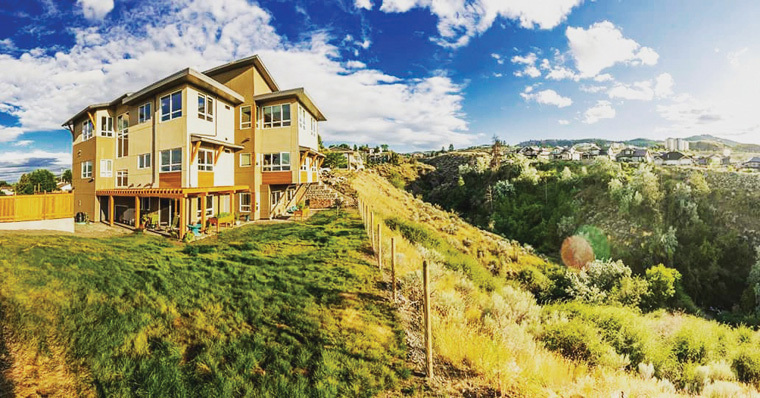 My day-to-day life happens within a shared cooperative home that my spouse and I have built with a group of friends in Kamloops, British Columbia (the RareBirds Housing Co-operative). My working life involves considerable travel away from the house as a freelance leadership consultant and small group facilitator. In another sphere of life, I am engaged in grassroots political activism and tossing my hat into the ring as a provincial election candidate with the Green Party. I can readily talk about any one of these areas of involvement. What intrigues me more and more is how they dance with each other: how they inform, challenge, and sustain one another into a whole, integrated, and less divided life. As I claim this interconnection of events, gratitude grows in me for the gift of being a member of an intentional community. Living with others is effectively a mirror for the human heart. My fellow “birds” help me to better see myself. They witness me into being. In that daily witnessing I am able to recognize my strengths and limitations; the light that I project into the world and my shadow as I block some of the light. It requires great courage to see myself as I am. Yet the community lends me a courage that I lack. My ability to facilitate small circles of leaders has been deepened in the difficult and joyous relational realities of living with friends in our shared home. The cooperative has also gained from what I bring back into the community from my vocation. We have included some of the small group practices in our way of being together that I use for my work with leaders. For example, we have explored in our extended retreats together the Quaker-inspired practice of hosting a “Clearness Committee” for each other: a two-hour disciplined listening that uses simple, honest, and open questions. The evening meals and lively conversations together with my fellow “birds” have been a generative field for political engagement. We challenge the conventional views. We rant and rave! We slow down enough to allow our self-righteousness to lessen in the light of a deeper wisdom. We find our voice and personal agency as we try out new perspectives together. I wonder how it would be possible for me to consider political involvement without this safe space to hear my voice, to be heard and respected, and to also be safe enough to be transformed in my own thinking. I have also been recognizing some of the practical benefits of being in “a village” and living in this supportive way. I write this from the airport as I travel yet again to facilitate some programs. Meanwhile, the community is planting the front garden as I sit here typing. I will come home in a week and find new vegetable garden boxes in the back yard. I will see some photos of the progress this week on Facebook! And I look forward to arriving back home next week to contribute to this work. I benefit from the flow of life that goes on when I am away and for the warm welcome on return back into that flow of life. We will exchange stories and from that exchange, we will see further into the reality of things. Dan Hines lives in RareBirds Housing Co-operative (www.rarebirdshousing.ca). In addition to working in leadership consulting and small group facilitation (with the collaboration of the Center for Courage & Renewal and Parker J. Palmer), he is active in a refugee resettlement team and the Green Party. See also Dan’s website, www.danhines.ca, and the interview at www.asmallgoodthingfilm.com/dan_hines. ← Do you organize with the Moon?